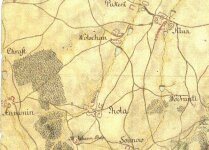 Several farmsteads are known from the family history where Wybornys had lived or which they had managed as their stewards. Almost no traces of some of the farmsteads preserved up to now whereas certain remains of the other ones still exist. 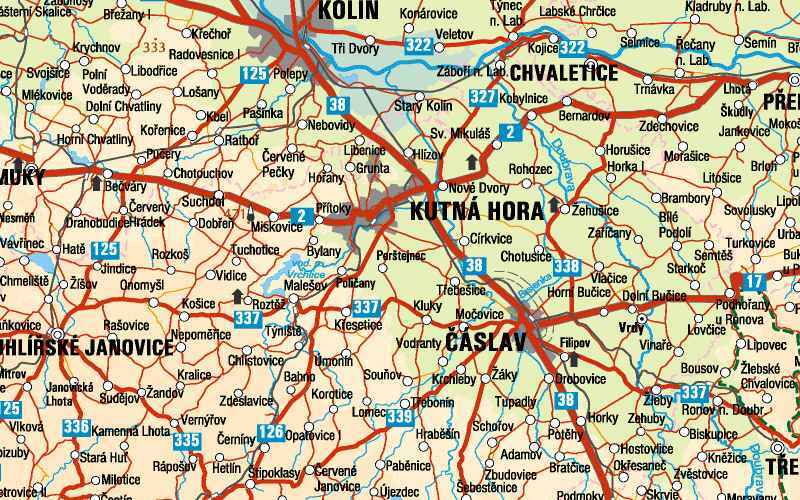 we can compare them to the present situation (modern maps courtesy http://mapy.quick.cz). 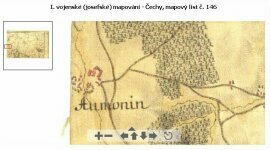 Also detailed information collected in "The Vyborny Book" helps us to understand better the lifestyle of Vyborny ancestors at those localities. 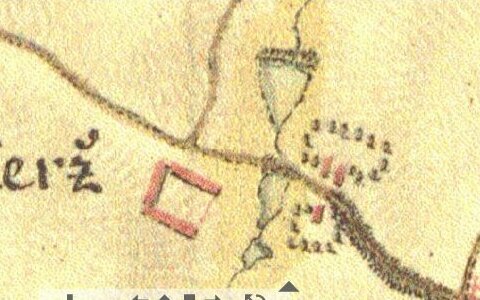 Stone buildings are denoted by red color in the early military maps. Those built of wood are yellow-brown colored. Roads (brown - except of the most important so called "Emperor's roads" which are red), creeks and ponds (blue) are shown in the maps together with some other important objects (forests, bridges, crosses, water-mills, rows of trees, etc.). (high resolution). . 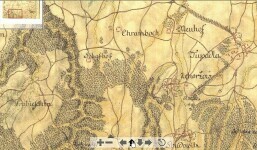 Detailed map of early Pucher. No houses existed northern from the farmstead before 1768. Only 3 little buildings surrounded by some trees are shown eastern from the three ponds on the creek. 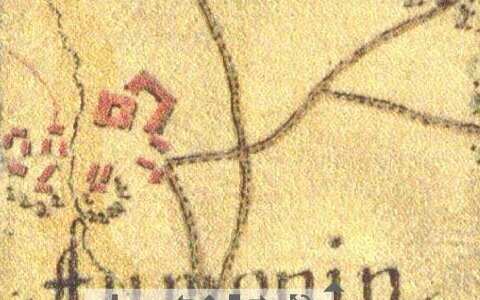 More houses were located south-eastern from there behind the road crossing (with a chapel and a cross). They belonged to the village of Kluky yet. The largest building there was the chateau of Kluky. (courtesy of Dr.Jan Masek). Detailed part of the sketch. 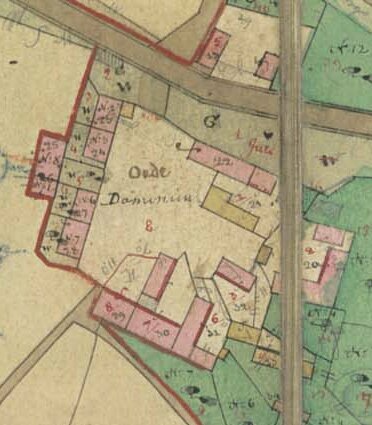 Ground plan of the former famstead denoted by yellow. Click on the picture to compare it to the non-modified map. The former Jesuit farmstead was subdivided into smaller farms called familije during the Raab agricultural reforma in the 1780s. Enumeration of the farms was transferred to the house numbers later. 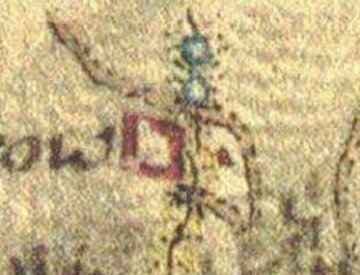 The numbers are written both in the houses symbols and in the corresponding gardens (green) and fields (brown) in the sketch (click on to magnify it). The names of farmers are written in the field areas. 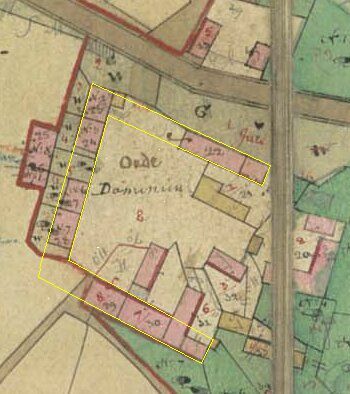 The house Nr.7 belonged to Jiri(*1780) the son of Jan(*1747) around 1838 (he died in 1845). The red marked building perpendicular to the original No.7 was built after the Raab reforma, Jan(*1747) died there in 1826. 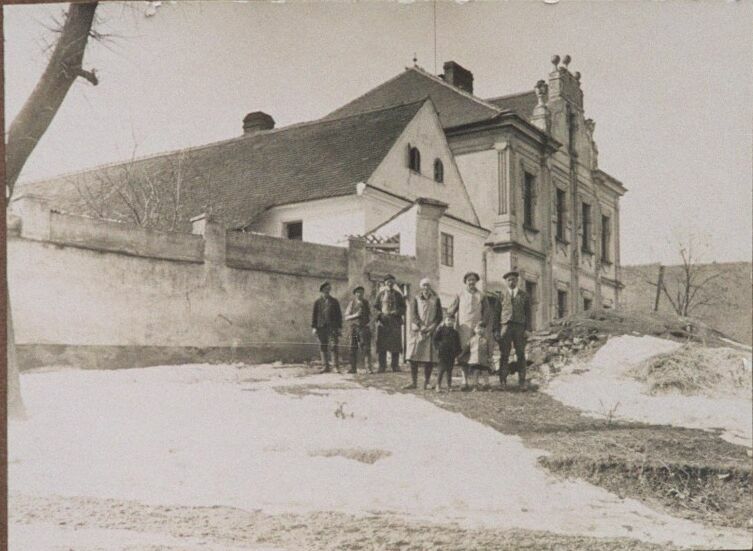 The view of eastern part of this building is illustrated by the photograph (courtesy of Mr.Snizek Sr. - the higher house behind No.7 was built around the turn of century /1900/ and was the villa of Alois Vyborny the Mayor of District of Kutna Hora). The eastern part of building No.7 was removed in 1968 (see the present view of the house N.7). (high resolution). 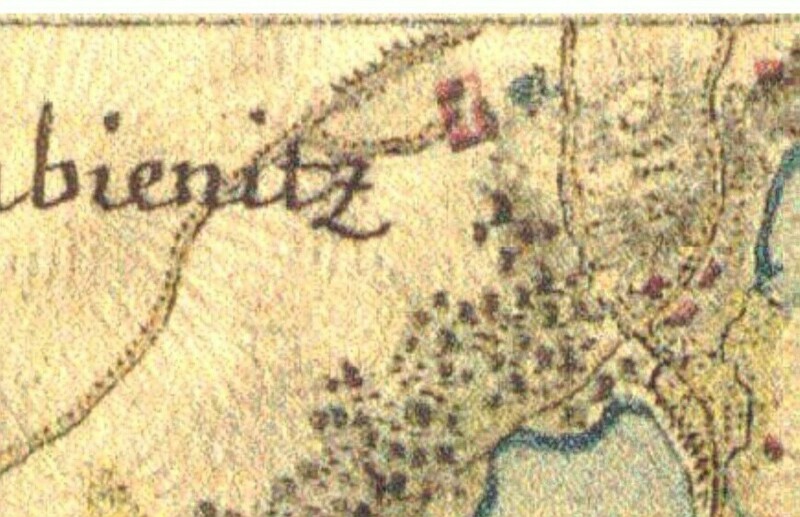 Detail of the previous map. 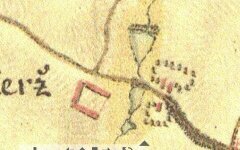 The former farmstead of Umonin is the red object on the N-E edge of this locality. 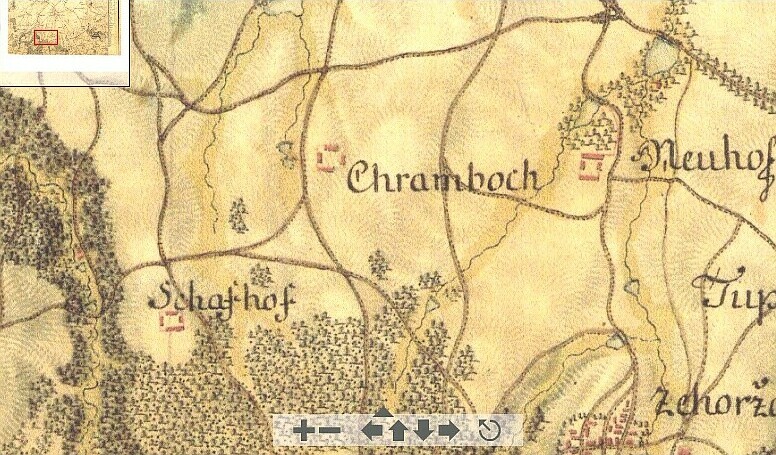 The trapeziodal red object just to west from the farmstead is the chateau of Umonin. 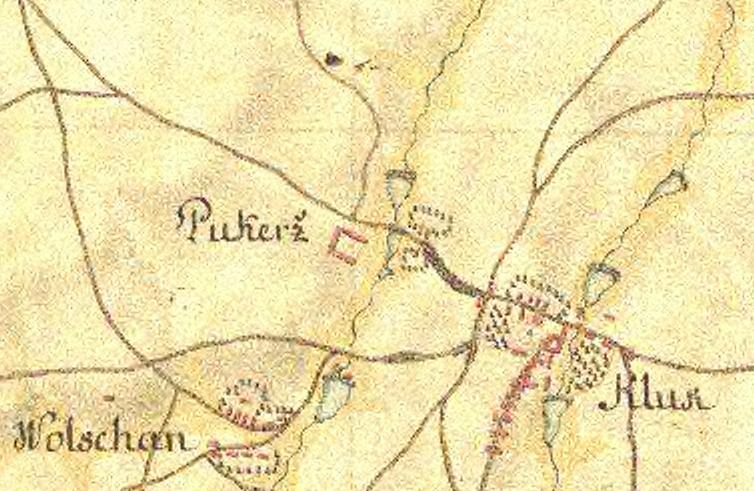 Jan(*1747) Wyborny together with his brother Jiri(*1748) rented the farmstead at Umonin for twelve years (1791-1802, see "The Vyborny Book" pp.77 and 82, the acreage there was about 250 acres). They were prosperous both there and at their "familiant" farmsteads at Pucher. They did not prolong their farming at Umonin due to retirement, however (Jiri died 1804). 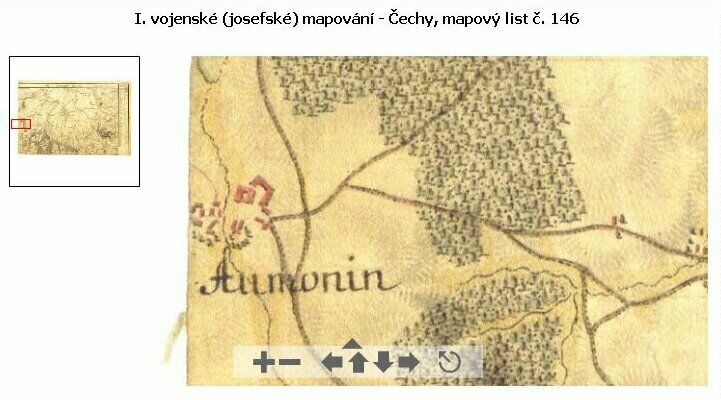 Map of the region Umonin(SW) - Caslav(NE) before 1768. 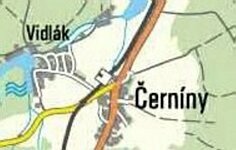 Present map of the region of Cerniny. 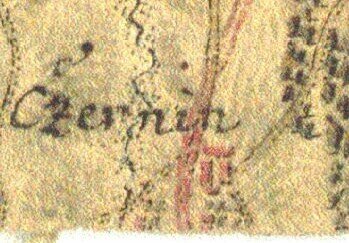 Detail of present Cerniny. (high resolution). Detail of the previous map. The former farmstead of Cerniny is the red object east from the main red road in the upper sheet of the combined map (see also below). 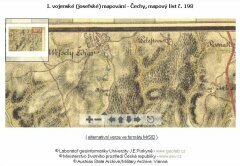 According to the parochial records of Zbraslavice the following children of Jan(*1747) Wyborny were born at Cerniny: Katerina(Jan, 1773), Vaclav(Oct, 1774), Anna(Mar, 1777). Jan Vyborny served the Cerniny's farmstead as a supervisor at that time. Surroundings of the farmstead of Cerniny before 1768. 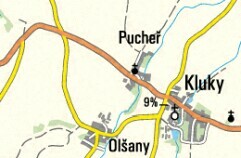 Present map of Pabenice region. 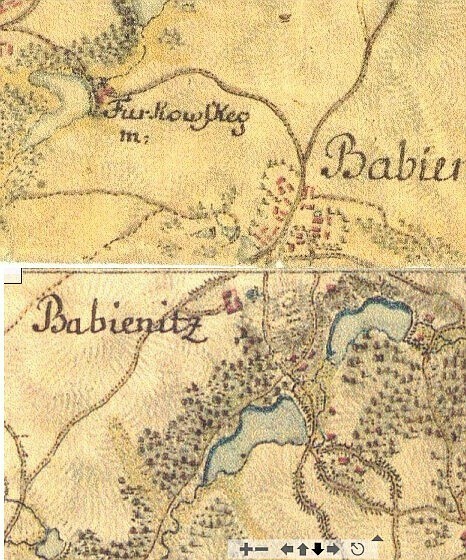 Detail of present Pabenice. 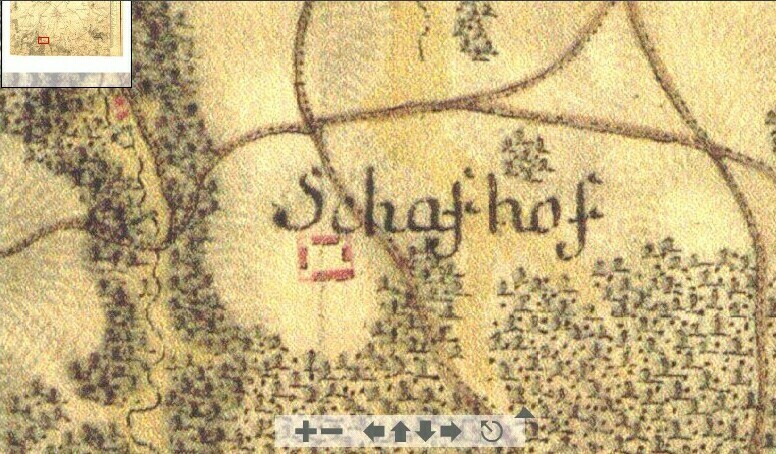 Detail of the previous map. 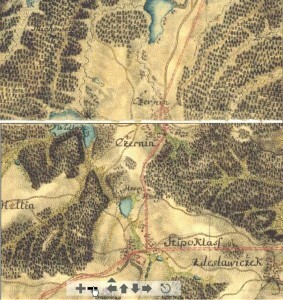 The former farmstead of Pabenice is the red object in the lower sheet of the combined map near the center of its top (see also below). 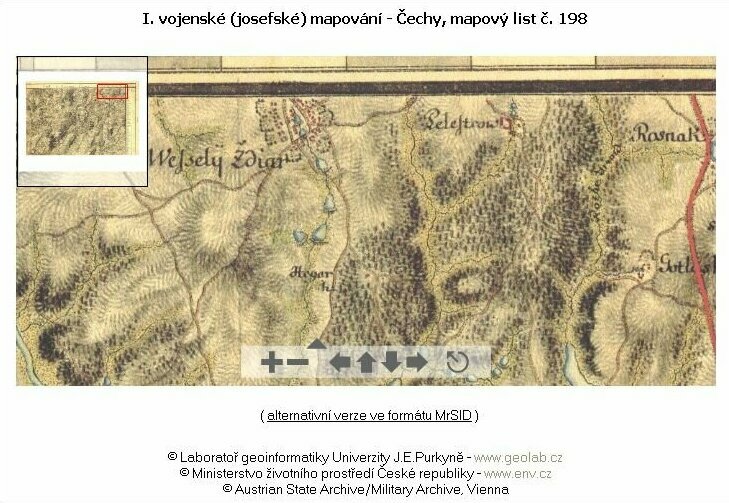 Jan(*1811) Wyborny's greatgrandfather, Waclaw(*1717) Jr., and his greatgreatgrandfather, Waclaw(*1690) Sr., worked at the farmstead of Pabenice as field masters. Surroundings of the farmstead of Pabenice before 1768. Present map of the region of Strampouch. 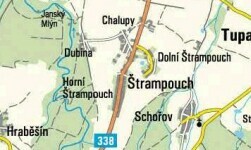 Detail of present Strampouch. 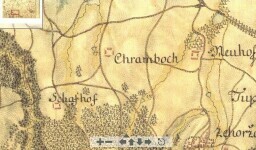 Detail of the previous map. 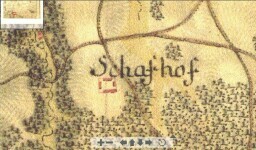 The former farmsteads of Strampouch are the red colored objects (on the left). Detail of the sheep-fold at Strampouch. 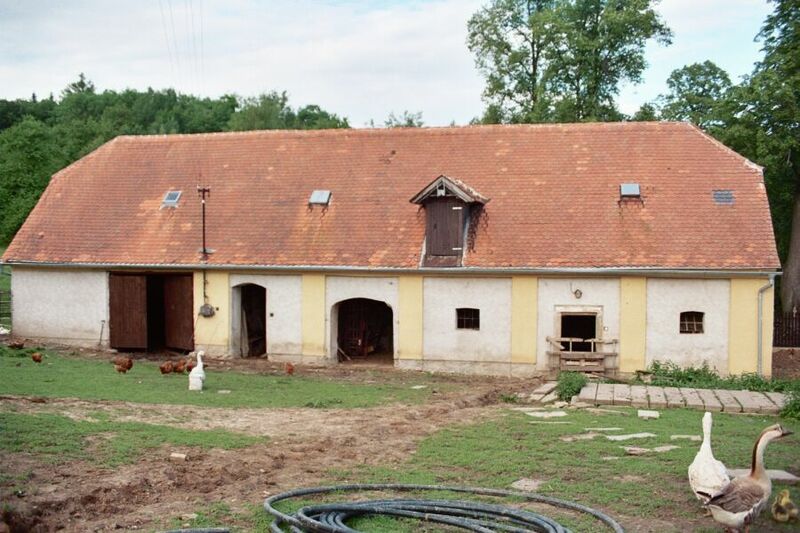 Detail of the farmstead of Strampouch. 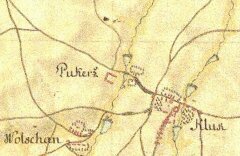 Jan(*1747) Wejborny (the grandfather of Jan*1811) had served out at the farmstead of Strampouch to became a field master. 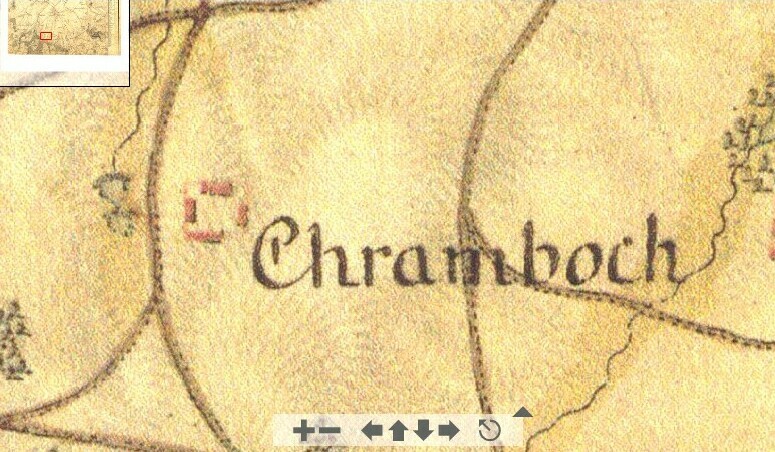 This was the origin of his nickname "of Strampouch". 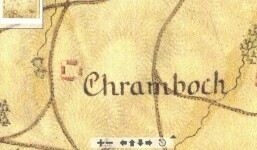 Also his settlement at Pucher was later called "at Strampoussky's". 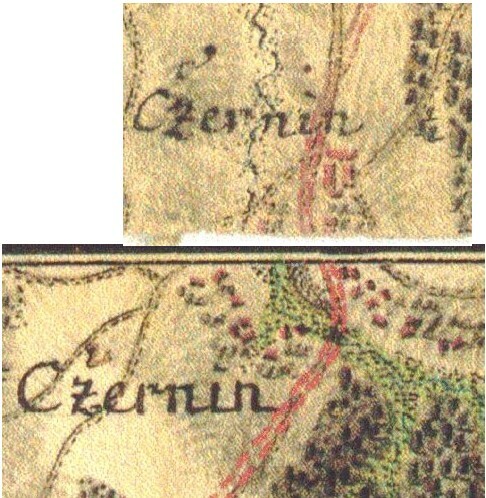 Present map of Pelestrov locality The region of Vesely Zdar, Pelestrov and Roznak before 1768. Pelestrov surroundings. 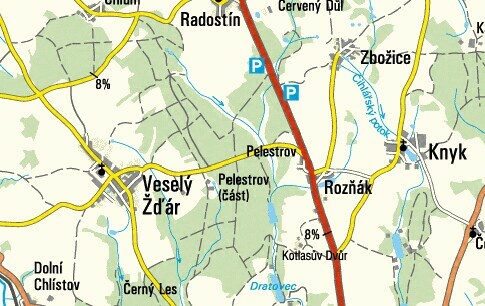 The locality of Pelestrov farmstead. 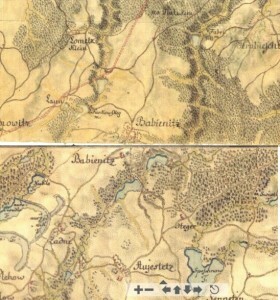 After the mid 1700s, roads connected the landlord farmstead of Pelestrov to that of Kotlas (Gotlashofe in the right bottom corner of the map of Pelestrov and surroundings). 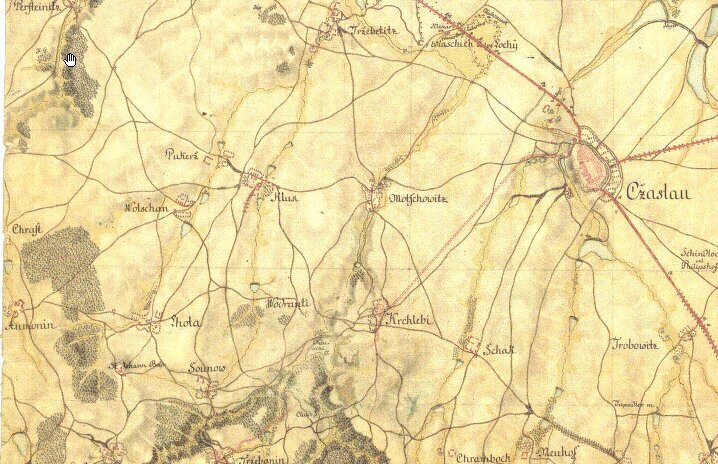 Those roads no longer exist (see the present map above). 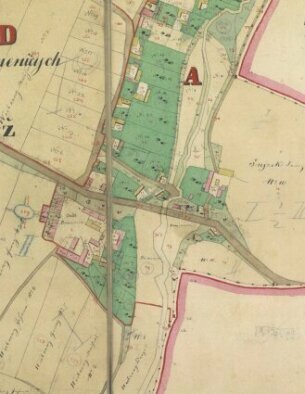 One of the roads connected Gotlashofe (belonging to the town of Nemecky Brod) to the small watermill at Pelestrov (see the sign of watermill wheel on the creek just near to S-E corner of the farmstead). 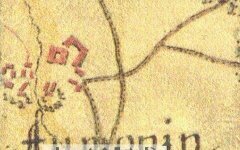 The second road continued east toward the small chapel and then between the pond and the northern side of the farmstead. 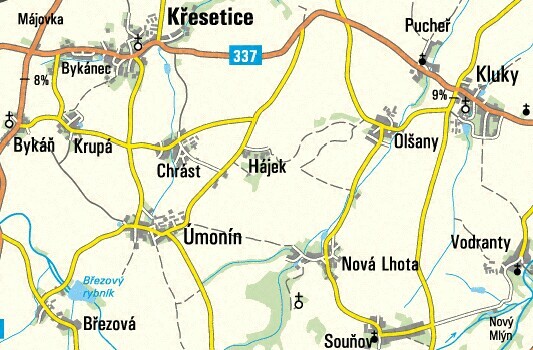 The main ("Emperor's" - of special military transport importance) road is shown connecting Nemecky Brod (south from Gotlashofe) to Caslav (north from Roznak/Rosnak). 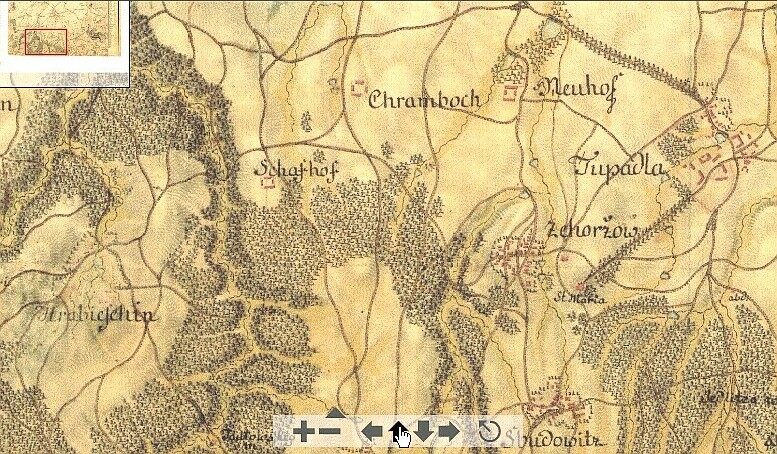 Prof. Carl Vyborny took part in interpreting the map during Jan 2004. Historical data courtesy Dr.Jiri Pavlicek. 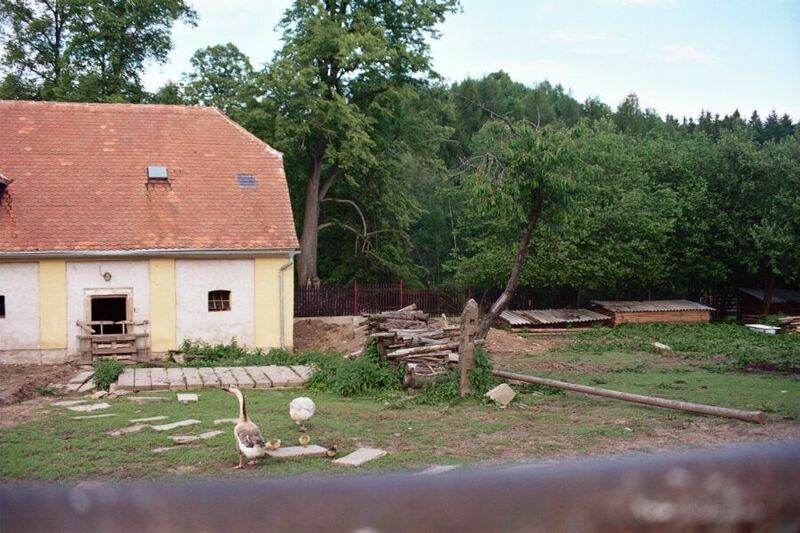 The former Pelestrov farmstead in detail. Jan(*1726) Vyborny has been the steward (manager) there before 1776. 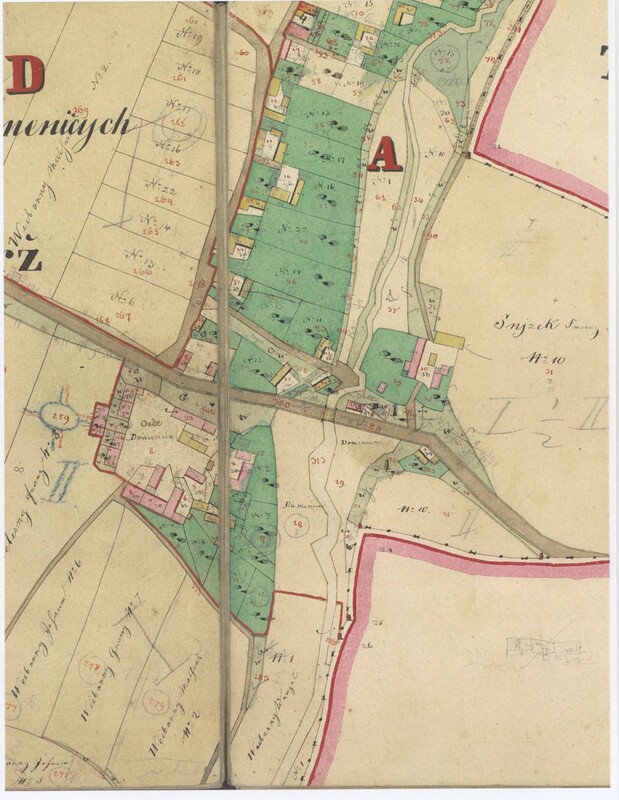 At least one other steward of the farmstead was known also as the Mayor of the nearby village of Vesely Zdar at the same time (this indicates the important status of the steward). 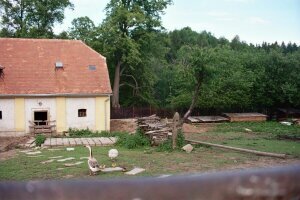 The following pictures show the present view of the former farmstead of Pelestrov (courtesy Mrs. and Mr.Barta). The barn there corresponds probably to the former western part of the farmstead. Even one small pond exists on the creek behind the barn (though rebuilt and somewhat moved from its former position), the other one was removed during 1900s.